Semeru Trekking Tour Packages Bromo Rafting 4 days 3 Nights or Semeru Climbing Tour Package – Bromo – Rafting Songa Pekalen. 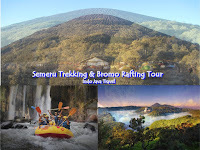 Combination of Bromo Tour, Rafting Songa River and adventure of Hiking Mount Semeru (Mahameru). Mount Semeru is the highest mountain in java, so when you reach the summit of Mount Semeru (name is Jonggring Saloko – 3,676 MDPL) then you have managed to stand in the highest place on the island of Java. In addition to feeling it in the climbing route of Mount Semeru you will enjoy the beauty of Ranu Kumbolo, a very beautiful and legendary volcanic lake. This long vacation package is not just stopped with the beauty of mount Semeru (3.676 MDPL). but the participants will also be invited to enter the Bromo Caldera or sea of sand. and see the sun rising from the north side of Bromo called Mount Penajakan (2770 meters) and then continue to raft on river of Pekalen Probolinggo. then your long vacation will be pleasant and your impression will never be forgotten. These three tourism objects are favorite places of tourists who like adventure. This Tour Pckage starts from picking up in Malang, Jogjkarta, Ketapang Bayunwangi port, or from Surabaya. For full details of the program, read the following. Pick-up starts with our team who will pick up at Surabaya airport or hotel (Malang also available) according to your plane ticket, then drive to Pekalen Songa area with 3.5 hours car transport duration. Lunch at local restaurant while on the trip. Arrived at the Pekalen area, have a short break then continue rafting with duration of 2 hours, and the length of the track is about 3 Km. After rafting we back to Camp bath, lunch, then proceed to the Tengger mountains, when arrrived at Tengger mountains chek in lodging (hotel, Homestay, Villa), and a break to Bromo, Upon arrival in Bromo area check in hotel, followed by dinner and sleep. continued to Ranu Pani tour with Hartop/Jeep companied by trekking team (one hour from Bromo). Arrived at Ranu Pani, check in climbing equipment after finished Semeru climbing permission letter then have a rest in inn, the next day will be continued trekking to Ranu Kumbolo. In the morning after breakfast the journey will continue to enterance gate of Camping, after all checked we go toward Kumbolo lake about 4 hours duration. Arrived in Kumbolo lake, take a rest for moment and wait for porter team preparing lunch for you. Enough for rest we continue to trekking to Kalimati Base Camp with duration 3-4 hours trekking. The Hiking participants will pass a beautiful scenery a Climb-Love, Oro-Oro Ombo and Cemoro Kandang, arrived at Kalimati in the afternoon then have a rest and dinner. Wake up at 01.00 a.m and prepare to trekking to Mahameru summit. Before that hiker/climber go through Arcopodo first about 1 hour (here the hikers/climbers are tested before climbing to the top of Semeru). reached at Arcopodo then continue to the Top of Mahameru passing sandy land wich has steepness 75 degree, it will take 4 hours journey with that condition, arrived at the summit around at 5 a.m morning, then enjoy the sunrise while watching at smoke of Semeru cauldron. After satisfied enjoying the panorama we back to Kalimati Base Camp to have breakfast, and continue to Kumbolo lake. In Kumbolo lake we have lunch and explore the lake, then go back to Ranu Pane pass through Ayek-Ayek. From Ranu Pane to Cemara Lawang Bromo we take the Hartop/Jeep. After all we back to Surabaya at the airport and the program is complate. That’s all the article of Semeru Trekking Tour Packages Bromo Rafting 4 days 3 Nights, we as tour agent of trekking volcanos in indonesia also provide combinations of other package such as : Trekking mount Welirang and Arjuno, Trekking mount Ijen and mount Raung and also trekking mount Argopuro. About the price and facilities also acomodations please contact us.